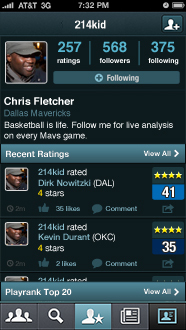 PlayRank Basketball is the mobile community app for NBA fans. Watch your team and rate players as the game unfolds. 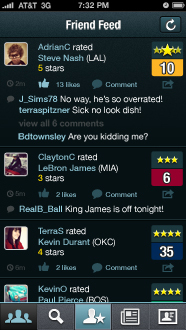 Share and discuss your ratings with friends to experience the game on a whole new level. PlayRank allows you to voice your opinions on any player. Did Kobe just hit the three? Give him 5 stars. Did Lebron miss both free throws? Slap him with 1 star. Rate players as often as you like during the game. Your ratings are automatically shared with your PlayRank friends, or you can post them to Facebook and Twitter with additional commentary. Who’s overrated? Who’s underrated? Stats tell one side of the story, but PlayRank’s fan-driven ratings give you an up-to-the-minute read on what NBA experts everywhere are thinking. PlayRank is the edge you need to get ahead in your fantasy league or pool. Browse the list of the day’s games and see what’s on tap. 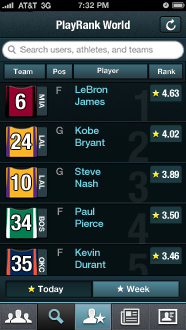 PlayRank covers every game with every NBA team. 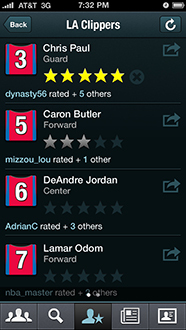 See who your friends are rating and join in to follow the action in an all new way. Rate players as they dunk, rebound, and nail threes. Whether a rookie is on a hot streak or a veteran is choking in the last quarter, you can share your opinions with the world. It’s like watching the game with all of your friends, wherever they may be. Follow players as they move up and down the rankings during the game. Is Lebron cooling off in the third quarter? Watch his PlayRank fall. Is Kobe in Black Mamba mode? Watch him rocket to the top. Did your best friend rate Carmelo two stars? Call him out by commenting directly on his rating. When a player gets injured but his rank doesn’t drop, check the comments to find out how he played through the pain. Keep up with your friends’ latest activity. Compare ratings – was Lebron’s dunk really worth five stars? 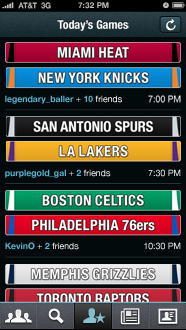 Plus find new friends to follow and track your favorite players.